Only 30 days left to raise funding supporting the legal effort to block the building of a road across the Serengeti. The Serengeti and Maasai Mara represent a world heritage site under siege. Your contribution is important to the group I am working with, the Africa Network for Animal Welfare (ANAW) in Nairobi. Please lead a hand, a gift of any amount is appreciated. The effort so far has been supported in total by the Serengeti Watch people and their network. It would not be accomplished with out Serengeti Watch. A big thanks to their organization. This last push rests with ANAW and and ANAW’s friends. Can we count on your help? Please go to the link below and make a contribution of any amount. Check out related stories and reference to the legal battle taking place. The status at this juncture of the “legal battle” is fully on the shoulders of ANAW. Please join the community of conservation monitors and experts. The article is noteworthy because it is describing the lengths criminals pursue to evade detection. All this is fueled by consumer demand for animal parts. Bangles, or bracelets are easily disguised as plastic. There are few techniques for testing the composition of items declared as something that is not horn or ivory. Ivory bracelets are labeled “vintage” or “antique”. Shipping handlers are stymied and have little recourse but to accept the shipment as is. How can they question the age of an item? In practice the burden of proof of age falls to the agent and veracity of the owner shipping the item. Today, I did a search on eBay and found many bangles for sale that look like ivory. EBay prohibits the sale of ivory on its site because eBay doesn’t accept the documentation of age from owners. I wonder if anything slips through and is published for sale? Perhaps someone reading this blog knows how on-line marketing groups like eBay monitor bangles and ivory-looking objects. I would be interested in knowing more. I don’t want to disparage legitimate dealers, but who monitors the claims that ivory is pre-ban and can they prove it? The volume of pre-ban bangles for sale on the Internet is impressive. I found one pre-ban bangle priced at $700. 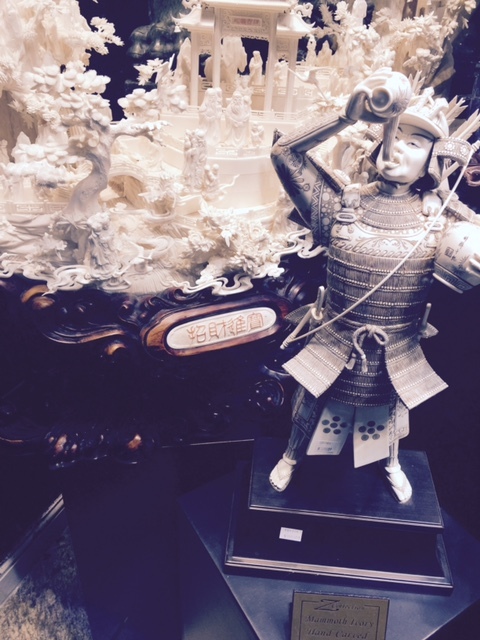 Ivory carvers from China moving to Africa to ply their trade is disturbing. It puts tradespeople closer to the source of ivory and bone further encouraging demand. It also suggests the markets in China are expanding. Edmond and Stiles, in their landmark 2008 publication, Ivory Markets in the U.S.A, identified fewer than 200 ivory carvers in this country (pages 21-23). In the U.S., carves worked ivory for knife-handles, billiard cues, jewelery, musical instruments, scrimshanders, restored antiques, netsuke and handgun grips. I’m not aware of an inventory of carvers since this publication which suggests the trades are dying out in the U.S. The news in the BBC article suggest the trade in carving ivory is far from dead. This is all the more reason for the bringing attention to the expanding markets worldwide. We should not be complacent that the poaching of African wildlife is going away. We might be hopeful the situation is changing. Fewer elephants were poached in Kenya in 2014 than in 2013. However, the observations about animal trafficking and general preparedness to identify, arrest and prosecute criminals is not encouraging. 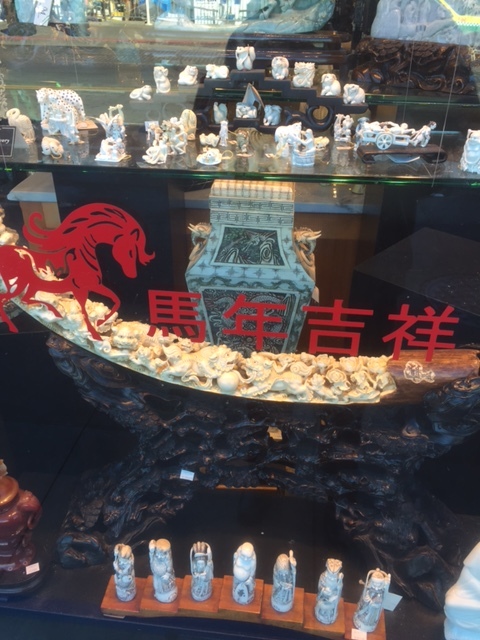 Finally, selling ivory is still a problem for us in the United States. The purchase of ivory feeds supply lines and commerce requiring more dead elephants. A colleague visited San Francisco California last month (January 2015) and took these store front snapshots. If the American public wants to buy ivory, there still is a lot of it for sale. Today in the Saturday Nation there is a interview with Lieutenant General Humphreys Njoroge, retired. He observes experts handled the hostage situation badly. Trained in the United States, at the Army War College, he wrote a paper way back when about the importance for joint training of the Army and the Police. It is regrettable that there was confusion about who was in command on September 21. I am saddened for Kenya, the death, the destruction of Westgate Mall, the looting and the tragedy of it all. Njoroge talks about the moral fabric of the country suggesting some of the old times should be called out of retirement. Kenya is a beautiful country. I hope the best for Kenya as it continues in its economic growth.